--I am still not exactly sure why BC Lions president Rick Lelacheur was giving his opinion on how to make CFL games more attractive for millenials, but it was a giant swing-and-a-miss amongst football fans of all ages. The idea of shortening a football game to 12 minute quarters is somewhat ludicrous. It might be fine for minor football, but not the pros. No one is suggesting MLB games should be shortened to seven innings, no one is suggesting NHL games should have 15 minute periods, etc. 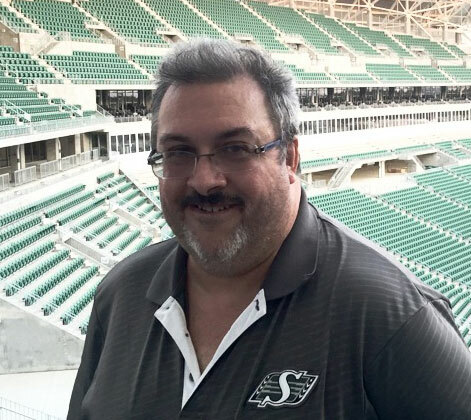 As I said on the Sportscage earlier this week, if you are going to shorten the time frame of a game, you had better make a substantial reduction on the cost of tickets. Perhaps that is the problem. I don't know what the average CFL ticket costs. I have no idea who has the highest priced tickets and who has the lowest priced ones. However, it would seem as if some are turning away because of cost. It is why teams have to be more creative when it comes to ticket sales and marketing. At the end of the day, winning is the best marketing tool of all and sadly, all nine can't teams can't win. It is a problem that can be discussed for years, but the right answer won't come because there is no right answer. --The Rider Nation is excited about Sunday's Labour Day Classic and they should be! The /=S=/ are playing their best football of the year. Is it a coincidence that this has happened after the release of Duron Carter? The Bombers will provide the Riders with a battle on Sunday, but looking at what way the two teams are trending right now and the history of the Bombers in Regina on the first Sunday in September, I see Winnipeg being "Innepeg" again because there will be no "W". If that should happen, the heat will grow on the Bombers. There is some talk that perhaps Mike O'Shea's job is in jeopardy should the Riders sweep this series. It can't be that bad there despite what has happened the last two weeks is it? Matt Nichols has not helped with his statements over the past two losses that have had people rushing to his defence. If Nichols should struggle, (and I see him doing that), it could be another long week in the Manitoba capital answering questions. If the Bombers win, it will be Chris Jones answering the tough questions. Again, winning cures so much! --The Duron Carter experiment in Toronto is not going to work. It may short-term, but there are already signs it is doomed to failure. Carter's first bout with the Toronto media was interesting as you would expect. Carter when asked why he has not been able to stick with a team put it all on the teams saying you would have to ask them and not me. DC just doesn't understand what a talent he is and how good he could be if he actually worked at it. If Carter had his head screwed on right, he would be getting ready to play in the NFL where he would be a media's delight. However, he seemingly refuses to take any blame in why he has gone from team to team to team. Argos coach Marc Trestman has already sent a message by saying Carter won't play for a while. I am guessing Trestman sat him down and had a "I talk, you listen" speech in which a number of pre-requisites were laid out. Pre-requisites that he has to meet over the next two weeks if he wants to play. Will Duron show the maturity needed to meet what it is asked. We will find out! --What do the Regina Rams have in store for us this season? We find out starting tonight at Mosaic Stadium as another Canada West football season starts. Steve Bryce has gotten his team to the playoffs in his first two years and there is no doubt it should be three in a row, but do they have enough to beat some talented Calgary and UBC squads. They start it off against Calgary tonight in a 7 o'clock start. The big question for me going into the season is what will Noah Picton do in his final year? Believe it or not, his game likely improved over the off-season after going to Argos camp and learning from Marc Trestman, Ricky Ray and Anthony Calvillo. Picton is already a young man who is very driven, but with this being his last chance to lead the Rams, I think he has a season to remember. Hoping to see a lot of you at the stadium tonight as everything kicks off. --Many are still talking about Brooke Henderson's historic win at the CP Womens Open at the Wascana last weekend. Some are saying its one of top moments in Canadian sporting history. I was asked where that would rank. I say another Henderson gets that honour and that is Paul for the 1972 Summit Series. Brooke's win is top 10, but I don't know if I would have it ahead of Mike Weir's win at the Masters. Where are you on that when it comes to what moment is the biggest in Canadian sports history? --Publically, Tom Brady will say all the right things when asked about the huge contract Aaron Rodgers signed with the Packers this week. When he is home and talking to Gisele though, one has to wonder what he is really saying. --The NFL season begins in one week. Have you ordered Sunday Ticket yet? Consider that a friendly reminder! --If you haven't seen the TSN documentary on former Oiler and Red Wing Joe Murphy called "Finding Murph", I would suggest you look for it. How the mighty have fallen! It is somewhat sad to see what happens to some when the lights no longer shine on them. --Summer's not over yet is it? Can we keep some warm weather until November. The Farmers Almanac says it will be teeth-chattering cold this winter on the Prairies. Great! That's all I got. Have a great Labour Day weekend! Scruffy, I think you totally missed the point in "Finding Murph". You should watch it again. On the Carter/Argo thing did you hear the latest joke? SWC I have to agree with your Murphy comment. It's not like he went out and blew the millions he made and ended up destroying himself. He rec'd a devastating head injury and it lead to the end of not only hockey but family life. Yes drugs were involved but they too were a result of that head injury. It's not somewhat sad Scruffy, it's terribly sad and the NHL turning their back on him is unforgivable!